Sweating is primarily a means of thermoregulation which is achieved by the water-rich secretion of the eccrine glands. Evaporation of sweat from the skin surface has a cooling effect due to evaporative cooling. Hence, in hot weather, or when the individual's muscles heat up due to exertion, more sweat is produced. Sweat is bodys natural mechanism for waste disposal and temperature control. Some people sweat more than others-in a condition called hyperhydrosis. Hyperhidrosis is a condition characterized by abnormally increased sweating, in excess of that required for regulation of body temperature. It can be associated with a significant quality of life burden from a psychological, emotional, and social perspective. Hyperhidrosis can either be generalized, or localized to specific parts of the body. Hands, feet, armpits, and the groin area are among the most active regions of perspiration due to the high number of sweat glands in these areas. When excessive sweating is localized (e.g. palms, soles, face, underarms, scalp) it is referred to as primary hyperhydrosis or focal hyperhidrosis. 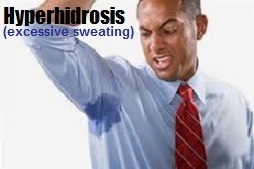 Excessive sweating involving the whole body is termed generalized hyperhidrosis or secondary hyperhidrosis. It is usually the result of some other, underlying condition. The cause of primary hyperhidrosis is unknown, although some physicians claim it is caused by sympathetic over-activity. Nervousness or excitement can exacerbate the condition for many sufferers. A common complaint of patients is they get nervous because they sweat, then sweat more because they are nervous. Other factors can play a role, including certain foods and drinks, nicotine, caffeine, and smells. Primary Hyperhidrosis can occur in the hands (palmar Hyperhidrosis), in the armpits (axillary Hyperhidrosis), on the face (facial Hyperhidrosis), or in the feet (plantar Hyperhidrosis). Primary Hyperhidrosis is usually treated with home remedies.  1.2 What are Problems in Conventional Methods of Treating Hyperhidrosis? 1.11 What are Food Habits, Vitamins and Lifestyle Changes for Curing Hyperhidrosis? Patients with palmar Hyperhidrosis have wet, moist hands that sometimes interfere with grasping objects. Most patients with palmar Hyperhidrosis also consider it a difficult social problem since every time they shake hands, they leave the other person's palm very moist, a sensation most people find unpleasant. Those who suffer from axillary Hyperhidrosis sweat profusely from their underarms causing them to stain their clothes shortly after they dress. Once again, this proves to be very unsightly and a social disadvantage. Plantar Hyperhidrosis is the excessive sweating of the feet and leads to moist socks and shoes as well as increased foot odor. The most uncomfortable feature of this for me was slipping and sliding out of my sandals in summer. What are Problems in Conventional Methods of Treating Hyperhidrosis? You’ll notice that these conventional treatments take a completely different approach to the home remedies regime shared here. They rely on either cutting the nerve impulses to the sweat glands, reducing the amount of acetylcholine, destroying the sweat glands or blocking off the sweat ducts so that the sweat cannot flow out onto the skin. These work by causing the sweat to thicken so as to block or plug your sweat ducts thereby reducing the amount of sweat that reaches the skin. They are considered to be the least invasive of all therapies so this is generally the first treatment that a doctor or specialist will suggest. Antiperspirants are available either over-the-counter or by prescription from your doctor. Aluminum chloride hexadhydrate concentrations of 10% to 15% are recommended for excessive sweating of the underarms. For the hands or feet, higher concentrations are needed - usually around 30%. Antiperspirants can be tried for facial sweating, too, but because skin irritation can occur, it’s important to talk to your doctor before applying an antiperspirant to such a tender area. He or she may have recommendations about which antiperspirants, or active ingredient concentrations, may be more suitable for the face and other sensitive skin areas. The main immediate drawback with antiperspirants for me is that they cause skin irritation which isn’t much of a surprise when you consider the cocktail of chemicals they contain. Some manufacturers recommend completely drying your skin before you apply an antiperspirant and then washing it off after 6 to 8 hours to minimize the risks of skin irritation. I’ve only found one deodorant that doesn’t cause me significant itching and soreness – the details are in the resources section at the end of the guide – so I use them sparingly, if at all. A second problem is that they have to be frequently reapplied, or else the clumps in the ducts will get dissolved, unblocking the ducts and permitting sweating. Thirdly, the very act of blocking the sweat ducts is unnatural. Sweating is an essential body process and should not be blocked by artificial means. It seems obvious that if the sweat can’t escape via the blocked ducts it will migrate to other parts of the body. Finally, the aluminum they contain can build up in your system with long term use. This has been linked to Alzheimer’s disease. Personally, I find the idea of antiperspirants nothing more than a ‘sticking-plaster’ solution to the problem of sweating. In my opinion, if you use anything that contains toxic ingredients on a long term basis, you’re asking for trouble. They are OK as emergency, temporary relief but they do nothing towards actually getting to the root cause of the problem. As for putting them on your face, as some people recommend, I won’t even comment! In this treatment, electric currents are passed through the skin in order to disrupt the function of the sweat glands – thus preventing them from working. The electric current "shocks" the sweat glands, and they stop making sweat until they recover. Used correctly and adjusted to individual situations, Iontophoresis has proven to have a very high success rate (83% according the American Academy of Dermatology) for people with sweaty palms and sweaty feet. Machines are available for home use. The immediate drawback for me was the initial cost. You can find the machines on the Internet for about $500 but this was too much for me – especially when I discovered that I couldn’t use the treatment for other parts of my body such as under my arms. Affected areas may become too dry and crack but this can be alleviated by decreasing the frequency of the treatments. There is no risk of electric shock because the current used is very small but most patients report a tingling sensation and mild pain especially in the beginning of the treatments. For the method to work, the body part you want to treat must be immersed in water. This means it is only really suitable for hands and feet – not faces or under arms. A final consideration is the time that is required to do the treatments and the fact that the treatments have to be continued indefinitely. A typical treatment takes about twenty minutes on a daily basis. For me, this was unacceptable. The theory behind oral medications such as anticholinergics is that they block the neurotransmitter, acetylcholine, from stimulating the sweat glands. Other medications that seem to have had an effect on Hyperhidrosis include antihistamines antidepressants, and some of the tranquilizers. These are some of the possible effects of anticholinergics which is seen on cases reported by patients. The FDA approved Botulinum Toxin Type A (BOTOX®) to treat severe underarm sweating (axillary Hyperhidrosis). It is injected into the skin and acts by temporally blocking the acetylcholine. It is injected at 1520 sites in the underarm. A decrease in sweating is usually noted soon after the injections. Botox injections are painful and expensive. Since the treatments have to be repeated every 4-6 months the expense may be substantial. 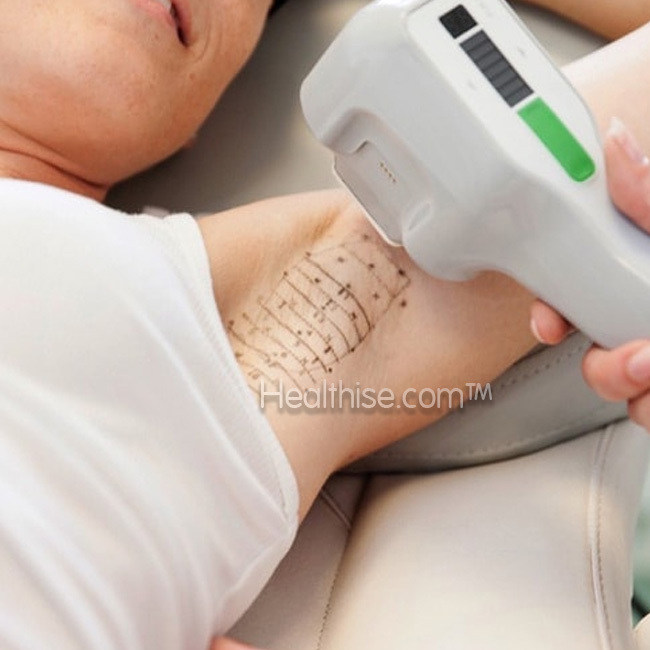 They seem to provide a suitable treatment for underarm sweating but have only had limited success on other parts of the body with most patients being reluctant to receive multiple injections in their hands and face. Botox has also been associated with temporary paralysis of the hand muscles. The big disadvantage to Botox is that, once again, the injections do not cure Hyperhidrosis; the symptoms will gradually return so expensive follow-up injections are required to maintain dryness. These repeat injections may be necessary at intervals varying from seven to sixteen months. The surgical treatment of severe Hyperhidrosis is a procedure called endoscopic thoracic sympathectomy (ETS). The procedure entails cutting or destroying the Sympathetic nerve trunk but this renders the operation irreversible. During ETS surgery, physicians attempt to interrupt the transmission of nerve signals from the spinal column to the sweat glands and to thus prevent these nerve signals from "turning on" the sweat glands. Once the nerves are cut or destroyed, the sweat glands that are supplied by those nerves stop secreting sweat. The procedure is performed with the patient under general anesthesia. A miniature camera is inserted into the chest under the armpit. A lung is temporarily collapsed so the surgeons can cut or otherwise destroy the nerve paths associated with the overactive sweat glands. This procedure is permanent, and currently there is no reversal technique. After the surgeon completes this procedure on one side of the body he/she performs the same procedure on the other side. ETS has been used to treat severely sweaty palms and sometimes the combination of sweaty palms and sweaty underarms, but it is major surgery and a treatment with significant risks. Surgery is generally reserved for severe cases of Hyperhidrosis that have not responded to all the other treatment options as the risks of permanent damage are very real. The following risks are common to all forms of surgery: allergic reactions to anesthetic or drugs, infection at the site of operation, cardiac problems (heart attack, abnormal rhythm), stroke, pneumonia, blood clots, damage to arteries, veins, nerves and organs. The incidence of these complications is very low but such problems can arise with any form of surgery, and patients must be aware of all the risks no matter how small. In addition: other parts of the skin also lose their sympathetic nerve supply, so the skin may lose its ability to control its temperature and blood flow. This may lead to paleness and coldness of the skin where its nerve supply has been disrupted. People who suffer from blushing may find this side-effect desirable, as they will lose the ability to blush in those areas affected by the surgery. The most common side effect of this particular procedure, sympathectomy, is compensatory sweating (CS) and this is unfortunately quite common with most patients experiencing it to some degree. 1. Harad (Haritaki) grinded and applied on the body 10 minutes before bath helps to cure excessive sweating problem. 2. Goose berry (Amla) juice applied on the affected area before bath cures excessive sweating problem. 3. Raw Brinjal (Byangan) paste applied on the affected area before bath cures excessive sweating problem. 4. Alum (Phitkari) dissolved in water can be used to wash the affected parts which helps to cure excessive sweating problem. 5. Brinjal pieces with Poppy seeds (Khus Khus) grinded and this paste applied on the affected area before bath cures excessive sweating problem. 6. Roasted Green gram (Moong) powder mixed with water to make a paste. This paste rubbed on the affected area before bath helps to cure excessive sweating problem. 7. Brinjal pieces dipped in water for sometime and this water used to wash the affected parts cures excessive sweating problem. What are Food Habits, Vitamins and Lifestyle Changes for Curing Hyperhidrosis? Principle 1 - Eat the right foods to avoid triggering the sweat process. Excessive sweating is not an acute issue, it is chronic. By ‘chronic’ I mean that it is a deep-rooted, long established problem that will consequently take time to resolve. It will require several changes to help the body come back into balance, the biggest one being through diet. "Humans live on one-quarter of what they eat; on the other three-quarters lives their doctor." Egyptian pyramid inscription, 3800 B.C. Firstly you need to avoid the foods that cause over-stimulation of the SNS. I found that certain foods definitely make me sweat more than others – almost immediately after ingesting them so I’ve included details of these foods below. I’m also going to tell you about foods which are known to be calming and beneficial to the nervous system – the more you eat of these, the less stimulation your SNS gets! These are the items you should always leave off the menu. You will notice an IMMEDIATE reduction in the frequency of your sweat attacks when you do. They're not just unhealthy habits, but sweaty ones, too. Alcohol tends to dilate the vessels in the skin, increasing your body heat, and tobacco increases your body's levels of adrenaline, both of which will make you sweat more. Sugar can contribute to hyperactivity and anxieties – both of which will make you sweat - and interferes with absorption of magnesium, which as you’ll see later, is an important mineral for preventing heavy sweating. The average American consumes an astounding amount of sugar each week, which is not surprising considering that highly refined sugars in the forms of sucrose (table sugar), dextrose (corn sugar), and highfructose corn syrup are being present into so many processed foods such as bread, breakfast cereal, mayonnaise, peanut butter, ketchup, spaghetti sauce, and a plethora of microwave meals. Buy unsweetened cereals – porridge oats are healthiest. Drink 100% natural, freshly squeezed fruit juices or water rather than processed fruit drinks, soda or cordials which tend to have considerable amounts of sugar added to them. Sweeten your cereal with banana slices or raisins instead of table sugar. Choose fresh fruit or fruit not canned in heavy syrup to satisfy your sweet tooth. Go easy on or avoid foods that have the words sucrose, maltose, dextrose, fructose or syrup listed among the first three ingredients on the food label. These foods tend to contain high amounts of sugar. Don’t substitute honey for sugar – it’s just as bad. Try reducing the amount of sugar in your favorite recipes. You may be surprised that some recipes taste the same even when you reduce the sugar content by as much as 25-40%. Remember that refined sugar includes not only "sugar", as listed in ingredient listings, but also the brown sugar that is sold in the baking aisle in the regular grocery store. Other refined sweeteners to avoid are glucose, fructose and dextrose. Hidden sources of white sugar are in mayonnaise, ketchup, salad dressings and other condiments, unless you get them at health food stores. Replace your condiments with the white-sugar-free versions. A more obvious source of white sugar is in jams and jellies. There are now many all-fruit varieties sweetened with concentrated grape or apple juice. There are also jams that are sweetened with honey, dehydrated cane juice, or unrefined cane sugar. Caffeine, like sugar and nicotine is an adrenal stimulant and can trigger a stress response in the body even when no major external stress is present. It raises the production of the adrenal hormone cortisol, which causes the blood vessels to constrict and the heart to pump harder, leading to high blood pressure and anxiety. It is found not just in coffee and tea, but also in chocolate and some soft drinks. After eliminating caffeine from your diet you’ll eventually feel more awake and have a more even energy level throughout the day than when you were drinking coffee and tea. A few weeks or months after quitting, most people come to realize that they feel much better without the coffee habit. Then most people can enjoy a cup of coffee on occasion when a boost is really needed, without triggering a recurrence of the craving that one feels when it is consumed regularly. These are additional foods I have personally found to cause almost immediate sweating. Salad dressings - Coleslaw/ketchup/mayonnaise/salad cream. Almost all heavily processed foods (packet meals, microwave meals, pastries cakes and biscuits) containing lots of preservatives Bananas Honey! (I don’t eat meat so I can’t comment on the effects). You may be thinking that leaving these foods out of your diet would be an impossible, not to say extremely undesirable, task but initially you may not have to. The whole point of my plan is to make small adjustments, a bit at a time. You should definitely try and avoid caffeine, sugar and cigarettes because doing so will give you an immediate improvement, but from then on it’s a question of working with your body to discover for yourself which other foods you should leave out of your diet. Each person has unique dietary needs and food intolerances and as well as steering clear from the ones that I list above, you will no doubt discover others yourself that trigger your sweating as you become more tuned in to the role that the foods we eat play in determining our health. And remember, this program doesn’t have to be totally restrictive – you can adopt it is much or as little as you want depending on your circumstances. If I want to stay as dry as possible, I avoid my trigger foods. That means that now and again I treat myself but I know I’m going to have to suffer for it! In my opinion, this is a far better solution than surgery! However, if you notice no reduction in your Hyperhidrosis at all after making a few simple alterations to your diet, it may well be that a hidden food allergy is a contributing factor or cause. For example, if your body cannot tolerate dairy products, whenever you eat some, your immune system must work hard to protect your tissues from the harmful effects of whichever components of dairy don’t agree with your body. If your immune system is constantly at work to deal with such food intolerances, your sympathetic nervous system detects this as stress, and activates the mechanisms that are in place to help you during stressful situations, including the production of sweat. I heard recently of a young lady who was delighted with the immediate improvement she experienced once she completely cut out all forms of dairy food from her diet. If you suspect you may have a food allergy you will find a food allergy or intolerance test useful because randomly taking whole food groups out of your diet can leave you with an unbalanced diet that can cause other health problems. Additionally, you may become frustrated because you reach a point where you believe that everything you eat is causing a reaction. Seek the help of a nutritionist before making significant changes in your diet. Now let’s look at foods that may help reduce internal stress and so reduce your sweat. Foods that reduce anxiety and don’t over-stimulate the SNS I used to take so many vitamins that my friends said I rattled when I walked! The strange thing is that despite spending a small fortune on supplements and pills, I actually didn’t feel any better - and I still had a sweat problem. Guess what? I don’t take supplements any more. There’s no doubt that we need vitamins in our diet in order to function properly – and we even know which specific vitamins are needed for each particular job - but taking supplements is not the answer. For a start, supplements can’t be utilized by a body that is full of toxins and dehydrated – which most of us are. And secondly, nobody seems to be able to agree on what the safe levels are – how could they, we’re all different and have individual needs and tolerances! The recommended daily amounts (RDA) seem to have been arrived at on the basis of animal experiments, guesswork and the minimum amounts required to prevent deficiency diseases in poorly-fed societies. As a result we have little knowledge as to the real optimum levels our bodies need – although we do know that some vitamins can be toxic in large quantities! With this in mind, I decided it would be more sensible to ensure the diet is as free from processed food as possible (to allow nutrients to enter the bloodstream and be successfully absorbed) and to eat organic, natural foods that contain the nutrients the body needs. The following nutrients (and the foods that contain them) have been shown to support the body’s nervous system. I try and make sure that my diet contains a good proportion of these foods – in their natural, unprocessed state. Remember our aim is to help the SNS cope with stress so that it no longer over-reacts . The B-vitamins are often called the "stress" vitamins. When our bodies are forced to withstand the demands of physical or emotional stress, the B-vitamins and other key nutrients are the first to be depleted. The body not only needs specific nutrients to combat stress, but it must also replace the nutrients that stress directly uses up. Deficiency can cause fatigue and anxiety. The B-vitamins are water-soluble and are not stored in the body. This means that they are needed on a daily basis in order for the body to maintain healthy levels. As a member of the B vitamin family, niacin is required along with the other B vitamins when the body is coping with anxiety and panic. Niacin helps the body to release energy from carbohydrates, control blood sugar, and maintain proper nervous system function. The body relies on pantothenic acid (also know as vitamin B5) to support the response to anxiety and panic. Pantothenic acid helps produce stress hormones during times of psychological difficulty (emotional upset, depression, anxiety), as well as during other types of strain, such as chronic fatigue and quitting smoking. Riboflavin is beneficial for anxiety and panic because it converts other B vitamins to useful forms so that they can do their work. In addition, since it aids in the production of infection-fighting immune cells, riboflavin helps bolster the immune system. Vitamin B12 helps the body to cope with anxiety and panic because it works in concert with other B vitamins. B12 supports the nervous system and assists the body in converting food into energy. (neurotransmitters), such as serotonin, essential for the body to cope with anxiety and panic. Vitamin B6 may also help boost the immune system during times of anxiety. Because of its nerve and muscle support, magnesium is thought to be helpful for nervousness and anxiety. Magnesium is considered the "anti-stress" mineral hence its effectiveness in our war against sweat. Magnesium and its fellow macronutrient, calcium, act together to help regulate the body's nerve cells. In many nerve cells, magnesium serves as a chemical gate blocker - as long as there is enough magnesium around, calcium can't rush into the nerve cell and activate the nerve. This gate blocking by magnesium helps keep the nerve relaxed. If our diet provides us with too little magnesium, this gate blocking can fail and the nerve cell can become over-activated. When I discovered this I immediately thought of how this could well prevent the nerves of the SNS from become over-stimulated. Calcium is needed for normal communication among nerve cells is therefore vital in supporting the body during anxiety and panic. Some research indicates that dietary calcium may help lower blood pressure, which can be raised during times of anxiety. I’d like to share with you the one true super-food I use to ensure I get the anti-stress nutrients my body needs – without the need to buy expensive supplements that don’t seem to work. One of Natures richest sources of Vitamins A and C, wheatgrass contains all the known minerals your body needs as well as Calcium, Iron, Magnesium, Phosphorous, Potassium, Sodium, Sulphur, Cobalt, and Zinc as well as all the Amino Acids, making it a complete protein. It is also rich in the B Vitamins – even vitamin B17, which is said to selectively destroy cancer cells without affecting normal cells. I take a small glass of fresh wheatgrass juice every morning. How to Get Rid of Sweaty Armpits? What Are The Different Types Of Sleeping Disorders?